Since March 2012, when Governor John Kasich signed the Employment First initiative into law, the culture of Ohio’s developmental disabilities community has shifted significantly toward community-based, integrated employment – and not only in large metropolitan areas. DODD is pleased to spotlight success, and we thank the Darke County Board of DD for sharing this story. 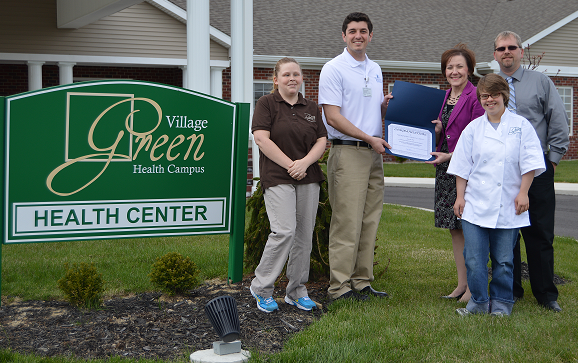 Village Green Healthcare Center in Greenville strongly supports the Employment First initiative in Darke County. After receiving her training through the Bridges to Transition Vocational Rehabilitation Public/Private Partnership grant, Village Green Executive Director Nick Anderson gave Erika Smith an opportunity for employment. She originally was hired at Village Green in the housekeeping department, as a part-time aide. The healthcare center staff immediately noticed Erika’s dedication – filling in wherever she was needed –her work ethic, and her passion for the job. They decided that she would be a better fit on their full time schedule. With the excellent training and support of Village Green administrative staff and co-workers, Erika began her full time position in the housekeeping department. (L to R): Erika Smith, full-time employee; Nick Anderson, executive director, Village Green; Tamala Marley, employment advisor, Darke County Board of DD; Lauren Warner, employee; and Rodney Willis, Community First director, Darke County Board of DD. Anderson also has reached out to the Darke County Board’s Community First department when in need of volunteers at Village Green. They note that volunteerism is open to anyone wishing to donate their time, according to Darke County Board staff. Volunteerism can build on experience and help develop social skills in the process – furthering opportunities for individuals to move forward in the spirit of Employment First. Employee Erika Smith has been featured in local newspapers during National Disability Employment Awareness Month last October, and in the DODD Pipeline Quarterly, Autumn 2014. This entry was posted in DODD News, Employment and tagged Employment First. Bookmark the permalink.